Medication really is the most effective treatment available for bipolar disorder. Scientific studies and anecdotal reports all point to this. Unfortunately, nothing is perfect, and for most people bipolar medications are a trade-off. You’re basically trading potential side effects for mental health. For some people the trade is easy to make. For others it can be very difficult. Side effects are the number one reason people with bipolar disorder stop taking their medications. And unfortunately they cause many people to give up on medications altogether, before finding the right one or the right combination that works for them. Though it may take a long time, most people eventually do discover medications they can tolerate. Other than side effects, another reason that people quit medications completely is that they believe they aren’t working, when in reality it’s often the case that either the dose is too low or the medication needs to be changed for a more effective one. People also stop or refuse their medications because they become manic and suddenly believe they are well and no longer need treatment. The goal for treating bipolar disorder with medication is to find the right drug or combination of drugs for each symptom area. There are specific drugs for mania, depression, psychosis and anxiety, and there are some drugs that help with all these symptoms. A person may need only one drug, or they may need more than one. They may experience no side effects at all, or they may have to deal with many side effects. It can take a year or more to find the right combination of medications and the right doses that work for you. I tried over a dozen different medications, for example, before finding one that worked, and believe me it was worth the wait. Your response to a particular medication or its dosage level can change with time. This is yet another reason why it is so important to pay attention to your symptoms and use an integrated management program like my Health Cards System. These include Lithium, Depakote (divalproex), Tegretol (carbamazepine) and Lamictal (lamotrigine). In a strict definition, the only true mood stabilizer is Lithium. The other three are anticonvulsant drugs that just happen to work well for bipolar disorder management, but they are all called mood stabilizers in terms of bipolar disorder use. Lithium, Depakote and Tegretol are antimanic drugs, while Lamictal is used for bipolar depression. Someone with bipolar disorder may take multiple drugs at once, such as a combination of Lithium for bipolar mania and Lamictal for bipolar depression. Mood stabilizers are notorious for a variety of side effects, and yet they are the most effective antimanic drugs on the market, which is why most people with bipolar I need to remain on mood stabilizers. Lithium is often prescribed first as it’s inexpensive and an excellent drug when it works. Common Lithium side effects include tremors (sometimes excessive), excessive thirst, memory loss and difficulty reading. Toxicity can also lead to kidney problems, and so monitoring Lithium blood levels is needed. The most common side effects of Depakote and Tegretol are weight gain, headache, nausea, dizziness, drowsiness, eye problems and unsteadiness. Weight gain is more often the one people can’t tolerate, but when the alternative is mania and possible hospitalization, some people prefer to deal with it. Possible Lamictal side effects include shortness of breath, neck problems, jerky body movements, itching and a skin rash. There are two kinds of potential rashes associated with Lamictal. One is benign and simply itches. The other is very serious and produces itchy sores. Treatment must be stopped if the second one occurs. Microdosing may help prevent both types of Lamictal rash. Lamcital does not cause weight gain and the side effects tend to get better over time. Older antipsychotics are called “first generation antipsychotics.” They include: Thorazine (chlorpromazine), Haldol (haloperidol) and Trilifon (perphenazine). These were effective but caused a lot of concerns due to the motor side effect called tardive dyskinesia. The newer antipsychotics are called “second generation antipsychotics” (SGAs) and include Clozaril (clozapine), Zyprexa (olanzapine), Seroquel (quetiapine), Risperdal (risperidone), Geodon (Ziprasidone) and Abilify (aripiprazole). Antipsychotics are used to treat psychosis, prevent mania and sometimes treat depression. Side effects of the SGAs include rapid weight gain, especially around the stomach, lethargy, restlessness (akathesia), dulled senses, tremors, impaired thinking, slow speech, shuffling the feet, and concentration problems. The main concern with the SGAs Clorazil, Zyprexa and Seroquel is that they can cause metabolic syndrome, a condition that relates to possible diabetes, heart disease and stroke. The antipsychotics with the lowest risk of metabolic syndrome are Abilify and Geodon. Risperdal is in the middle. While some of these potential side effects can be very strong, antipsychotics can be life saving medications that give a person the ability to work and function in society. If you have psychosis and/or full blown mania it is essential that you try multiple antipsychotics before giving up. It’s often possible to start with very low doses and then go up as needed. This is called microdosing. Many people eventually find the right anti psychotic with few side effects. You may already know the names of some of the most popular antidepressants such as Prozac (fluoxetine), Zoloft (sertraline), Wellbutrin (bupropion), Effexor (venlafaxine), Pristiq (desvenlafaxine), Celexa (citalopram), Cymbalta (duloxetine), Lexapro (escitalopram), etc. These drugs are extremely effective for depression treatment, but must be used with extreme caution in people with bipolar disorder, as they have a high risk of inducing mania. This simply can’t be stressed enough. Antidepressants can lead to increased rapid cycling and severe mania in people with bipolar disorder, and should never be used alone. They can be used, however, in conjunction with other mood stabilizers under careful doctor supervision with regular medication reviews. I know many people with bipolar disorder who use them successfully in this way. Common antidepressant side effects include agitation, weight loss or weight gain, headache, stomach upset, irritable bowel syndrome, sexual side effects, loss of appetite, leg-shaking, sleepiness, and most importantly, suicidal tendencies. It is essential that you and your health care professional look for signs of suicidal thoughts and behaviors if you start an antidepressant. These include: Ativan (lorazepam), Klonopin (clonazepam), Xanax (alprazolam) and Valium (diazepam). Anti anxiety medications are controversial as they can be addictive and some health care professionals are uncomfortable prescribing them for people with bipolar disorder. It is good to be cautious, but considering that so many people with bipolar disorder have anxiety and sleep problems, they should not be ruled out simply because there is a chance of addiction. An honest discussion with a health care professional is essential. On a personal note, I’ve used Ativan for fifteen years with no signs of addiction, and I have only recently needed to increase my dose in order to get benefit from the dug. I use it occasionally for anxiety, but mostly in order to sleep. On the other side, a good friend of mine had a twenty-year addiction to Klonopin that she only recently ended. She was taking up to five times the normal dose on a daily basis. I believe benzodiazepines are essential drugs for people with bipolar disorder, yet I also agree that these meds need to be monitored carefully. Common benzodiazepine side effects include tiredness, memory loss, trouble concentrating, excessive sleepiness, feeling “high” and lack of coordination. Benzodiazepine withdrawal can also cause very serious effects and discontinuation should always be done under a doctor’s supervision. It is essential to understand what the bipolar medications you are taking do and why they were prescribed. 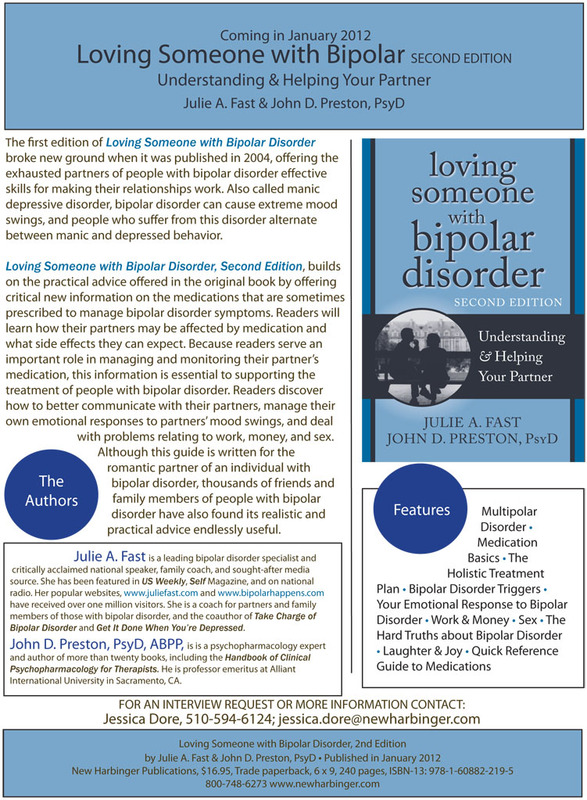 My coauthor Dr. John Preston wrote an invaluable book on this topic called The Medical Treatment of Bipolar Disorder, which can be purchased through this website as part of the Health Cards System. As mentioned above, side effects are the number one reason people with bipolar disorder stop taking their medications. I know. I’ve been there. However, I eventually found two that worked for me. And you can too. Here are some helpful points to remember in your search for successful bipolar disorder medication. Medication side effects can start out very strong and then taper off as the body becomes more adapted to the drug. Starting with a very small dose (microdosing) and then raising it slowly can make a huge difference. This is how I was finally able to tolerate Lamictal (Lamotrigine). People often have serious side effects with one or more bipolar medications and then stop taking bipolar drugs completely. This is a mistake as there are a great many options and most people, if they are persistent, can find at least one that works for them. Some bipolar medication side effects are simply impossible to live with, and it’s ok to let your health care professional know you need a change. It’s never safe to just stop taking bipolar drugs cold turkey. This can lead to serious complications. Speak to your doctor before you go off your medications or reduce your dose. People who manage bipolar disorder successfully through medications and a treatment plan live longer. This is a well documented fact. Many people see bipolar disorder medications as a necessary evil. Others see them as life savers that give them the ability to work, have relationships and stay alive. Yet no matter how one feels about them, the fact is that bipolar disorder treatment is most effective when a person uses both medication and a comprehensive treatment plan. It may take time to find something that works—and sometimes the side effects can seem worse than the illness itself—but finding the right medications is worth the time and effort.